This trip was the first to return to a reservation we had previously done ministry on. The Pine Ridge Reservation is the 2nd largest reservation in the United States and because of this we were tasked with working in a completely different area than in 2011. We were housed at the Chanku Waste Ranch with Pastor Matt Hadden and his family. What a testimony of God's creation as our camp touched the Badlands National Park area of the reservation. To wake each morning and see God's handy work was amazing. How heartbreaking to see living conditions and poverty and depression on such a beautiful area. We worked hand in hand with Pastor Matt to help repair a local church that had been abandoned but recently re-opened by the pastor. 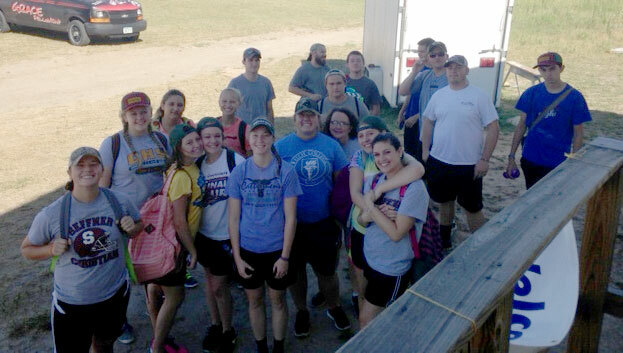 Pastor Matt's deep love and heart for these Lokato-Sioux people was infectious and our group was inspired to do a great week of ministry. We also did several home repairs and outreach stops. Let me share about several college leaders in our group who splintered off from our high school students to do some projects on their own. One of which was a request from an Indian grandmother to mow done all the over growth that was between her house and a grave on the hill beside her mobile home. The weeds and grass had gotten so bad she couldn't see the Cross on the grave marker where her grandchild was buried. Her request was “if you can just clear the way, so I can see the cross” Praise God that’s exactly what our trip was all about, clearing the way for people to see the Cross of Jesus Christ in all that we did. What a fantastic week that totally drained us physically but we were fired up spiritually. God used our group from Denver to Pine Ridge as we passed out Bibles at each stop along the way. Thanks to the Free Will Baptist home mission church in Castle Rock whom we got to be in service with this trip. Again, thanks to the First Free Will Baptist church family and all our sponsors who made this trip a reality.